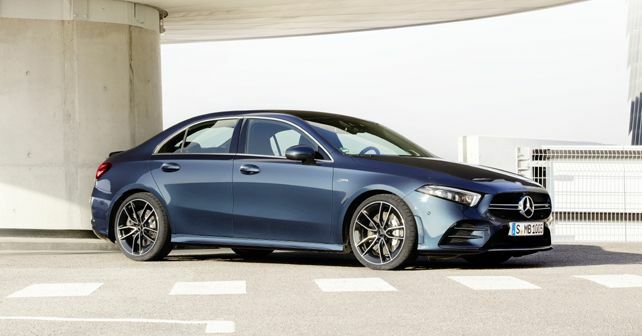 The latest entry-level AMG saloon from Affalterbach slots below the C43 and is the second model from Mercedes-AMG to feature the brand's new compact car platform after the A35 hatchback. In a bid to appeal to saloon-based markets like China and the United States, Mercedes-AMG has gone on to 'saloonify' the new A35 AMG hatchback, which offers more practicality and a roomy interior without losing out on any of the thrills of the hot hatch. With this, Mercedes now has a direct competitor to the likes of the Audi S3 and the BMW M240i. The A35 Saloon offers 2,729mm of wheelbase, same as the hatchback but is 130mm longer in overall length. Further, it offers a 420-litre boot to increase utility. The four-door saloon car features a twin-louvre AMG radiator grille at the front, which has been made bolder using signature AMG styling elements like the AMG Line front apron and a splitter. As standard, the car gets 18-inch, AMG 5 twin-spoke wheels, while a 19-inch version is available as an option. What makes the rear different from the hatch is the two-part taillamps, along with a new diffuser insert rounded off by a spoiler lip on the boot lid. Mechanically, the saloon remains pretty much unchanged, offering the same 2.0-litre, four-cylinder turbo engine that produces 302bhp and 400Nm of torque. Even the performance figures remain unchanged from those of the hatch, with an electronically-limited top speed of 250km/h and a 0 – 100km/h time of 4.8 seconds. Power is sent to all four wheels via the AMG Speedshift DCT 7G dual-clutch transmission and Mercedes' variable 4MATIC AWD system. However, the AWD setup is more of a Haldex-like front-biased system, which sends most of the power to the front wheels – only sending it to the rear wheels when needed. The standard AMG suspension on the A35 saloon uses McPherson struts at the front and a multi-link setup at the rear. However, for added control, the car can be ordered with the optional AMG Ride Control Suspension with adjustable damping. Inside, the changes remain predictable, as the A35 saloon gets Mercedes' new MBUX infotainment system, which is complemented by a new, distinct AMG centre console with touchpad and additional switches for operating the ESP, manual transmission mode and the optional adaptive adjustable damping. 'Following the very successful launch of the hatchback model, things are moving along dynamically in the compact class segment at AMG. Sport saloons are the origin of Mercedes-AMG and part of the brand’s core. With our new A 35, we are transporting this history into modern times in the form of a very attractive model that serves as a point of entry into the world of AMG and also appeals to new customer groups,' said Tobias Moers, CEO of Mercedes-AMG. Mercedes is yet to announce a final launch date and pricing for the A35 Saloon.